Perform a personal safety check. Before you even get on the bicycle, it’s important to make sure you and your child are ready to ride your bikes. A quick checklist includes the following: a properly fitted and secured helmet, a full water bottle for the ride, visible clothing, no loose backpack straps or coats tied around a waist that could get tangled in a wheel or the drivetrain, no loose clothing around your ankles (roll up your right pant leg), and shoelaces should be tied and tucked in. It is important to be in the right frame of mind when riding; a positive attitude leads to a fun and safe ride! Perform a mechanical safety check. When taking a bike out for a ride after a long hibernation in the garage, inspect the bike thoroughly from the front to the back to look for any malfunctions. It’s a good idea to visit your local bike shop to get a tune-up at the beginning of the season. Each time you use your bike, do an ABC check. A – Air, check that both tires are fully inflated. B – Brakes, test the brakes before getting on the bike by pushing the bike forward and braking with the front then the back brakes. C – chain, ensure that the chain is engaged on the gear cassette. Find a safe place to ride. Quiet neighborhood streets and cul-de-sacs are most family’s favorites. If choosing to take the kids on a more trafficked bikeway, such as SE Portland’s Spring Water Corridor, make sure they can stop, start and ride in a straight line without help (and adhere to our #4 tip of riding predictably). Ride predictably. Cars, pedestrians, and other people on bikes can all help avoid collisions when we can predict what a rider is going to do or where they are going. This means riding in a straight line, avoiding sudden stopping, and using hand signals to demonstrate intentions. Parents should model hand signals and predictable behavior on the road. Keep in mind that cars don’t expect people on bikes to ride on the sidewalks, especially at intersections. As a person on a bike, you are most visible on the road. Know (and obey) the rules. Unsafe situations can be avoided when we all play by the same rules. Remember to ride with the direction of traffic, not against it. Obey all traffic signals; bicycles are vehicles and must obey traffic signs and traffic control devices. Use a bell or loud voice to communicate when passing other people on bikes or pedestrians. 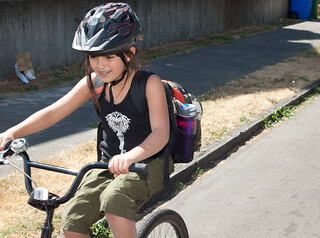 Introducing kids to safe biking practices early on helps instill good habits for life. If you don’t feel comfortable taking your kids on the road, consider registering your child for a bike education program such as the Community Cycling Center’s Bike Camp. Here’s hoping for safe and educational bicycling adventures!